With the intentions of preventing foreclosures and strengthening the financial system, the FDIC and the U.S. Treasury have created guidelines for modifying mortgages, and require that the guidelines be followed for a large class of mortgages. The guidelines include an income share target (for housing expenditures), a NPV test, and voluntary participation by borrowers. This paper shows how the facts that actual modifications do little to reduce principal, are still outnumbered by foreclosures, and add to borrower uncertainty, may directly result from incentives created by those very guidelines. Through their income share target and “NPV test,” the federal modification programs have manufactured a tradeoff between the number of foreclosures prevented in the short term and the durability of those foreclosure prevention efforts, because they make it impossible to both write down principal and offer modification to a wide range of borrowers. Another result of this tradeoff is to reduce collections, increase foreclosures and their costs, and reduce efficiency as compared to alternative means-tested mortgage modification rules. In many instances the programs create implicit marginal income tax rates in excess of 100 percent, and sometimes as large as 400 percent. One might expect a lot of income to be destroyed (or at least detoured off personal income tax returns where lenders might see them) in an economy where millions of people faced such massive marginal income tax rates, but, for two reasons, this paper does not investigate this possibility. First, reasonable people can debate the degree to which the supply of income responds to marginal tax rates, but resolving this debate is unnecessary for proving any of the results of this paper. Even if the supply of income were fully exogenous – that is, failed to respond even a small amount to marginal tax rates in excess of 100 percent – several of my results still hold. Second, under the weak assumption that borrowers cannot be expected to perennially locate at points of their budget sets that are strictly dominated by tens of thousands of dollars, lenders who want to enhance collections will take steps to foreclose on borrowers who are deemed modification-eligible by the federal programs. These steps will dull (but probably not eliminate) the otherwise stark incentives for borrowers to reduce their incomes in order to be eligible for a generous modification, and thereby result in an income distribution impact of the programs that is less than it would be had the guidelines been followed literally. The fact that foreclosures continue to outnumber modifications almost two years after federal initiatives began has been blamed on complex legal relationships among mortgage owners, and on administrative snafus. These factors may contribute to the relatively slow pace of modification, but, even without them, the federal income share target automatically frustrates the programs’ foreclosure prevention goals, thanks to the strong economic incentives it presents to borrowers and lenders. The same economic analysis explains why the federal guidelines discourage principal reductions (in favor of interest deductions) because principal reductions are consistent with only a narrow eligibility range, and implicitly impose marginal tax rates as large as 400 percent, despite the possibility that principal reductions would be a more durable foreclosure solution. Today: more steps away from democracy in Venezuela and Iran. I have been publishing forecasts on this blog, and put them in the NBER working paper series earlier this month. This morning, BEA releases its 2009 Q4 national accounts estimates. I have a busy day today, but I was able to check real consumption (which I define to be nondurables + services + nondefense government consumption). My model said $9.7187 trillion and the release today said $9.7195 trillion (2005 dollars): the two are within 1 one-hundreth of one percent! 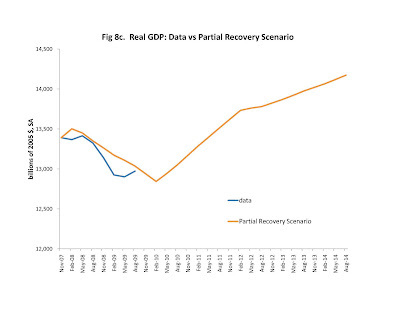 I think the real GDP and real investment releases are higher than I forecast, but I will confirm and post charts on Monday. Most people agree that Communism is bad news. But every once in a while you get some wise guy who says "China is communist, and their economy does great." Of course, China is not really Communist. You see, Communism is so bad, even the Communists don't want to practice it any more. That's part of the problem with analyzing mortgage modification programs. On paper, they impose marginal income tax rates far beyond 100% (think textbook Communism). That's why lenders are so tardy in making the modifications the Treasury recommends. In the end, we may only find that the effects of mortgage modification programs were bad, instead of truly terrible. But that doesn't mean that the federal programs were better than terrible - it just means that following them would have been so terrible that few lenders followed them! Both Democrats and Republicans last night said that "10% of Americans are unemployed." That is incorrect. The United States Census Bureau says that 15 million Americans are unemployed. It also says that America's population aged 16+ is 237 million. The population including children (they're Americans too!) is 309 million. 15 million is 6 percent of 237 million and 5 percent of 309 million: the percentage of Americans 16+ who are unemployed is 6% and the percentage of all Americans who are unemployed is 5%. Confusion arises because the "10% unemployment rate" commonly reported refers to the fraction of the LABOR FORCE that is unemployed. Millions of Americans are not in the labor force: many of them are willing stay-at-home-moms or stay-at-home-dads or gladly retired or children busy with school. Of course, when there's "confusion", there are politicians who cite the incorrect statistic that miraculously happens to be biased in their favor (in this case, "in their favor" is to appear sympathetic). In summary, unemployment (by the Census Bureau's definition) is currently 10% of the labor force, 6% of American adults and 5% of Americans. The aggregate neoclassical growth model - with a labor income tax or "labor market distortion" that began growing at the end of 2007 as its only impulse - produces time series for aggregate labor usage, consumption, investment, and real GDP that closely resemble actual U.S. time series. Of particular interest is the fact that the model - with no explicit financial market - has investment fall steeply during the recession not because of any distortions with the supply of capital, but merely because labor is falling and labor is complementary with capital in the production function. 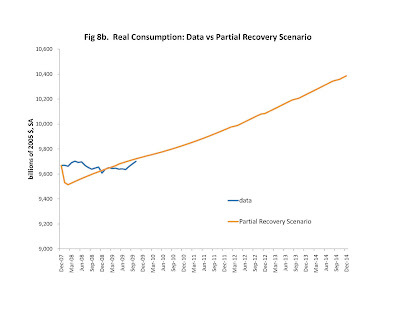 Through the lens of the model, the fact the real consumption fell significantly below trend during 2008 suggests that labor usage per capita could get somewhat lower than it was at the end of 2009, and is expected to remain below pre-recession levels even after the "recovery." Government deficits are often criticized because of the purported legacy they leave for the future. At least when it comes to the Obama and late-Bush deficits, this legacy is exaggerated. By definition, the government runs a deficit when its spending exceeds its taxes. It typically finances the difference by borrowing. Of course, government debt has to be someday repaid (otherwise no one would agree to lend to the government in the first place), which is why many observers conclude that these deficits leave us worse off in the future. Because our nation will be saddled with government debt in the future, its citizens in the future will either have to spend less, or work harder to pay it off. This lesson would seem especially applicable during this recession. Over the last two years, the federal government has run unprecedented deficits. The federal debt recently passed $12 trillion, a $3 trillion increase since 2007. Although we all acknowledge that the government has recently been spending a lot more than it taxes, some of us think that the “legacy” effect has been exaggerated for a couple of reasons. National savings is the sum of public and private savings, and is the purported channel through which public borrowing would reduce living standards in the future. However, to the degree that private saving offsets public borrowing, public borrowing leaves no such legacy. 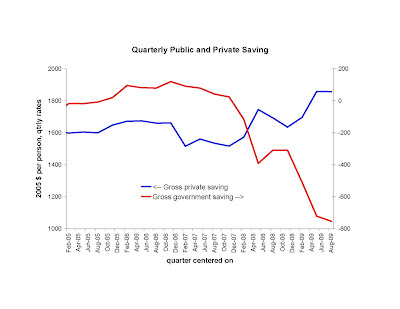 The chart below begins to examine the first hypothesis by separately graphing public and private saving as measured by the Bureau of Economic Analysis. Thanks in large part to federal government actions, quarterly public savings fell from about zero to negative $400 per person in the first two quarters of the recession, and fell another $400 per person in the first two quarters of 2009. Interestingly, private saving moved in the opposite direction, increasing more than $200 per person in early 2008, and increasing again about the same amount in early 2009. 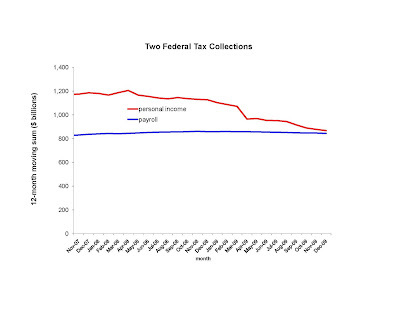 People were cutting back their personal spending more than their personal incomes were falling, even while their government let its spending outpace its income. Indeed, many people are saving because they expect their taxes to go up. The private saving offset was significant, although perhaps less than one for one. One interpretation is that national savings would have indeed increased if the government had, say, borrowed $1 trillion less, but the national savings increase would have been much less than $1 trillion. Alternatively, perhaps national savings would have been low regardless of the amount of government borrowing – after all, we are in a recession that might induce reasonable people (especially the unemployed) to borrow more, or save less. If so, then private sector saving may well have fully offset public borrowing in this recession. Although former Vice President Richard Cheney is credited with saying “deficits don’t matter,” public policy discussions rarely recognize that private savings will offset public borrowing. General-theory-Keynesian economists call for public borrowing to combat the “paradox of thrift” (in their view, saving harms a recession economy) but the private offset means that public borrowing only begets more private savings. Fiscal conservatives who call for tax increases in order to “combat the deficit” also ignore the offset. That’s not to say that government should spend without restraint: Government spending leaves less for private spending. Presidents Obama and Bush do not need to apologize for the federal debt, just the excessive federal spending. Much credit on this topic is owed to Professor Robert Barro. He has written op-eds like this over the years, such as this one in business week. During the legendary Obama electoral victory, I warned the celebrants (and assuaged the mourners) that the rhetorical gap far exceeds the policy gap. Democrats and Republicans are like Coke and Pepsi: they spend a lot of effort marketing their purported distinctions, while the chemists (like me) say that they are producing almost exactly the same product. Now Obama's team is talking about a spending freeze, and liberals are saying "I feel like an idiot for supporting this guy"! President Obama said today "I can guarantee that the worst thing we could do would be to raise taxes when the economy is still this weak." I agree. He only left out that the this "worst thing" is exactly what he and President Bush have done so far. The PPI for housing is a proxy for housing construction costs, which are an important determinant of housing prices. 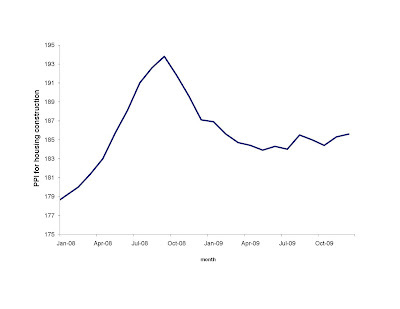 The December data released this morning suggests that the gentle upward trend continues. When Peter Orzag was heading CBO, CBO advocated UI benefits as a way to stimulate (sic) the economy. The argument was that people avidly spend UI benefits, and that spending is good for the economy. And then CBO throws in a footnote that the payment of unemployment benefits gives an incentive for people to remain unemployed longer, and even a citation to statistical studies finding exactly that. That footnote is accompanied by a claim that the "effect is probably less pronounced when jobless rates are relatively low." The Doug Elmendorf CBO tells exactly the same story, and concludes that UI is MOST potent of all stimulus tools! UI benefits will reduce spending by some people -- namely those who have to pay the taxes (or buy the government debt) used to finance the benefits. This offsets much of the "extra" spending those receiving the UI benefits (more on the offset here). Maybe it's true that the offset is not 1-for-1, but there is an offset and the result is something much less than the actual UI dollars disbursed. (This offset is ignored by both CBO reports, with no justification given). What evidence shows an effect of UI benefits on unemployment that is smaller during a recession? I already showed that labor supply shifts mattered just as much during this recession as they did before hand, and I do not see why the labor supply shifts associated with UI benefits would be any different. Even if effect of UI benefits on unemployment were smaller during a recession, CBO still admits that there is an effect, and a person who is unemployed rather than working is a prime candidate for spending less! So this is another way in which UI reduces spending. All together, we have two ways in which UI reduces spending, and one way UI benefits increase spending, and no evidence that showing that the one overwhelms the two. Even if, miraculously, UI were to increase aggregate (consumption) spending, what evidence do we have that (consumption) spending is better for the economy than saving?! So making the case that UI helps the economy grow is a logical chain with multiple terribly weak links. If any one breaks, the case for UI as a growth tool falls apart. The bottom line is that UI shrinks the economy. Yes, UI may be compassionate and the "right" thing to do, but then the honest recommendation is "Let's shrink the economy more in order to hand out more compassion." Instead, CBO is selling snake oil. As part of my playoff-watching hangover, I saw 60 Minutes for the first time in years. The show featured a story about American Somoa, with the headline of the extraordinary number of Somoans who play in the NFL. But 60 Minutes also mentioned (admitted!) that American's Somoa's recent experience vividly demonstrates how the minimum wage reduces employment. If it weren't true, and harming so many people, minimum wage advocacy would be truly comical! After initially increasing by almost three million during this recession, part-time employment fell sharply during the last five months of 2009. The federal minimum wage hike on July 24, 2009, is probably to blame. At first glance, any employment increase seems at odds with the basic current of this recession, which has been month after month of heavy job losses. In fact, full-time employment fell by 11 million, and much of the part-time employment can be understood as a partial offset to those losses. For example, some people laid off from their full-time jobs are having trouble finding another suitable full-time job, so they are working part time while they wait. Part-time jobs pay less than full-time jobs — even on an hourly basis — so some employers may be using part-time employees to accomplish tasks where they formerly might have used full-time jobs. From December 2007 until July 2009, for every five full-time jobs lost, part-time employment increased by one job. The blue series shown in the chart aims to predict the creation of part-time jobs from the data on full-time jobs alone, by assuming that each five full-time job losses created one part-time job. The series shows how this approach closely fits not only the overall increase, but also several of the changes in trend over that period. Since July 2009, full-time employment has continued to fall, but we no longer see the partly offsetting part-time employment increase. The July 24 minimum-wage increase most likely changed that pattern. 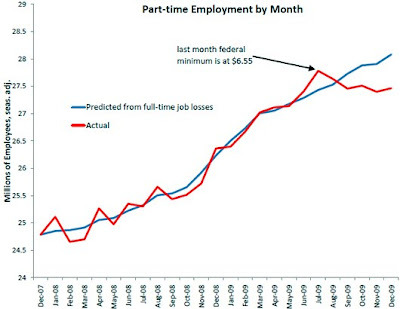 In other words, if the minimum wage had stayed at $6.55, part-time employment probably would have closely followed the blue series in the chart, as it did until July 2009. The federal minimum wage prohibits employment that compensates (not including fringe benefits) the employee less per hour than the federal minimum — $6.55 before July 24, and $7.25 since then. Thus, a $7-an-hour job was legal for most of July, but has been illegal since then. Many economists expected that the new prohibition on jobs paying between $6.55 and $7.24 would disproportionately affect part-time jobs. 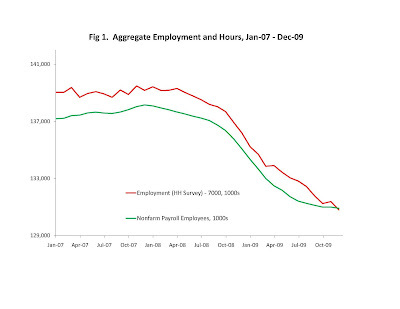 After all, recall that part-time employment typically pays less per hour than full-time employment does. Some of those employers raised their pay to conform to the new minimum, but others were expected to eliminate some of their part-time positions. That’s likely why the data show that, starting with August 2009, part-time employment began to reverse its prior trend. I do not know much about it, but will bet you that it, too, is means-tested. In other words, the more you earn, the more you can expect to be held accountable for your credit card debts. The late Senator Edward Kennedy was a Democrat deeply admired by most of those in power in our federal government. And he was voting with that "60 seat majority" of Democrats in the Senate, to which pundits have ascribed tremendous importance. When Senator Kennedy died on August 25th, why were we told about that? Would those in power in Washington be better off pretending he was still alive (it happened with Franco, and other powerful politicians)? Maybe having a look-alike come and cast his votes? Obviously the answer is "no" -- the public was in fact told about the Senator's death. But why, exactly, did those in power judge that honesty was their best policy in this case? One hypothesis is that, thanks to the U.S. Constitution, those in power would be severely punished for this type of dishonesty (interestingly, the punishment for their other types of dishonesty is often quite mild). Another hypothesis (and not necessarily contradicting the first) is that the pundits have exaggerated the importance of the 60 seat majority. In reality, 59 seats are almost as good as 60. Congress and the President have accomplished nothing with 60 Democrat seats -- is it so crazy that they would also accomplish nothing with 59? So even a small punishment for covering up the Senator's death would be enough to prevent such a cover-up, because that 60th vote is not really worth all that much. It only makes sense that Senator Kennedy's life ended honestly, and his death did not initiate a massive and thoughtful Democratic party expenditure to keep the Massachusetts Senate seat Democrat. Previously I have posted these forecasts as deviations from trend. Here are some forecasts in levels. "[most businesses have] been able to obtain all or most of the credit they need. What they don't have are customers." Time for Green Building Codes? California is talking about creating a "green" building code. I will put aside the question of whether a green building code is a good idea in the long run. If there is going to be a green building code, is now the time to start (rather than wait until after the recession)? Is California the place to start? Note that real estate prices have been much lower during this recession than before, especially in California. The low real estate prices (more specifically, the underwater mortgages associated with them) are responsible for a large fraction of our economy's poor performance of late. Also note that a green building code raises the cost of building new structures (if green building were costless, then there's no need for a government mandate! ), and perhaps adding on to existing ones. Existing structures compete with new structures in the marketplace, so introducing a green building code would raise the value of existing structures by raising the cost of building new ones. It will mean less construction output (and less living in a region with a green building code), which will depress land prices. It will even depress the value of land that has an existing useful structure, although the green code would increase the combined value of that parcel of land and its structure. There will be less construction output, but possibly more construction input, depending the price elasticity of the demand for living in the region. Thus, a green building code would not necessarily reduce construction employment. By raising the value of property with existing and useful structures, this could help alleviate one of the major problems in our economy (one offset is that some properties do not have a useful structure, and a green code would put mortgages on them even further under water), especially in California (less so in Nevada or Arizona, were the percentage of mortgaged properties with existing structures may be lower). So now may be the time for a green building code in California. Was There a Commercial Real Estate Bubble? A few economists have likened the commercial real estate market of the 2000s to the housing cycle. In fact, the commercial and housing markets were fundamentally different. As recently as last week (see also here), Paul Krugman has claimed that the commercial real estate market followed a “bubble” much like that of the housing market, and thereby concluded that the housing bubble cannot be blamed on anything unique to the housing sector. Mr. Krugman observed that real estate prices went up, and then came down, in both the residential and non-residential sectors. For example, he has presented the chart below comparing the Case-Shiller index for housing prices with a commercial real estate price index from Moody’s. In Mr. Krugman’s view, both “bubbles” had some of the same determinants. For example, lenders were hungry for risk, and they fed their appetites by investing in a variety of assets, like houses and office buildings. Thus, he takes comfort in his observations that the two sectors had real estate prices that moved roughly together. I have long disagreed with his interpretation, arguing instead that the housing and commercial real estate cycles had very different determinants. Housing boomed for residential-specific reasons, such as technical change biased toward homes, home-buyer optimism or lax home-mortgage standards. The housing price boom led to a jump in home construction, which pulled resources (workers, materials, and land) away from the commercial sector. 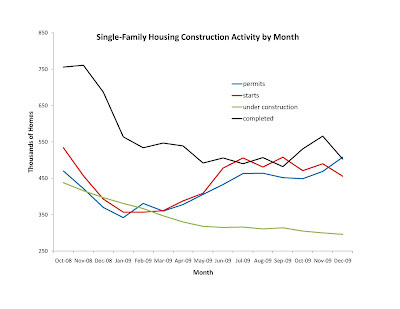 Commercial real estate construction was low during the housing boom, and only began to recover after 2005, once housing busted and construction workers and other resources were free to work on commercial projects. 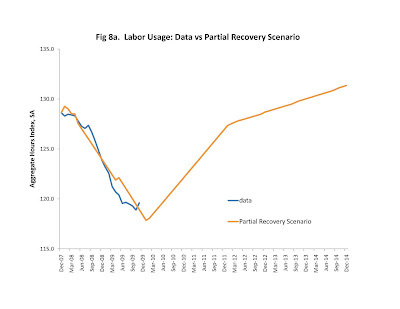 (The commercial recovery in 2009, however, was limited by conditions in the wider economy, such as the fact that fewer business were hiring and therefore in less need of space in which their employees could work). If Mr. Krugman were right, construction activity should have boomed (and then busted) at more or less the same time in housing as in commercial real estate. Thus, one way to distinguish my hypothesis from Mr. Krugman’s is to look at construction activity separately by sector. 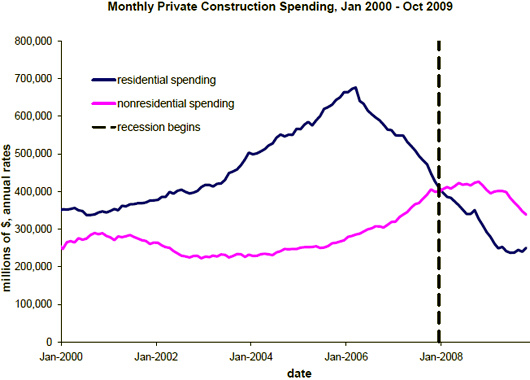 The chart below displays monthly private residential and non-residential construction spending from January 2000 to October 2009. Of course, housing construction spending increased dramatically during the housing boom (2002 through 2006), and collapsed during the bust. We see the opposite pattern for nonresidential construction spending, which failed to increase before 2006, despite the fact that nonresidential construction spending trended up in previous decades. Nonresidential construction spending increased significantly only once residential spending turned downward in 2006. Mr. Krugman’s price observation is a red herring, because commercial real estate prices should have followed a cycle like housing prices did, even if the housing boom was caused by factors specific to housing. First of all, commercial real estate prices should reflect the costs of constructing commercial buildings, which increased during the housing boom (and then fell during the housing bust) because so many construction resources were being used for building homes. Moreover, some commercial buildings can be converted to residential buildings, and conversions were common during the housing boom. This is another reason why a residential-based boom would show up in commercial real estate prices. Thus, I see little evidence of a commercial real estate bubble that was inflated with the same fuel as the housing boom. 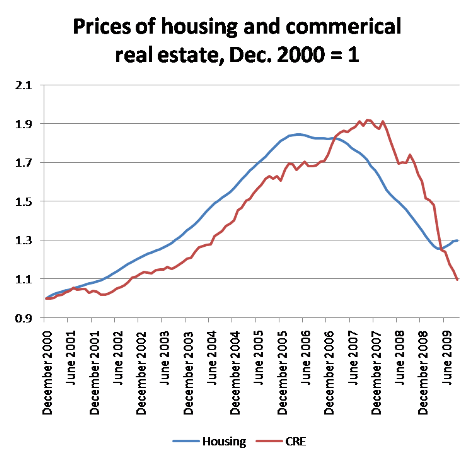 Rather, commercial real estate seemed to be reacting to the situation in the housing sector, and in the wider economy. Household Survey Shows No "Deceleration"
The chart below graphs monthly employment as measured by the household survey (red) and payroll employees (green). I have subtracted 7000 from the household survey in order to put them on the same scale. The household survey shows little, if any, reduction in the rate of job loss. Which survey should we trust? The household survey is based on a smaller sample, so for that reason economists tend to discount its monthly fluctuations. For a given sample size, economists think that the household survey is more reliable for most purposes. Thus, if a pattern in that data is repeated a couple of months in the household survey, then sampling error cannot be blamed for creating that pattern. Although some observers look at the green series and expect an upturn soon, as I posted yesterday, there is at least as much room for employment to fall over the 4-5 months as to increase, even on the basis of pure statistics. [My forecasting model gives another reason, separate from the household survey, that employment could fall: consumption behavior seems to indicate that consumers have long expected the recession to get a bit worse than it had gotten through Nov 2009]. The Dec employment report comes out tomorrow. My forecast for labor usage (aggregate hours worked for both the private and public sectors) is below. I expect labor usage over the next four months to stay within one percent of what it was in October 2009. By September 2010 (the last employment report to be released prior to the election), labor usage will still be below what it was when President Obama was inaugurated. Note that labor usage here is not detrended. Thus, I expect labor usage to fall further below trend between now and the next election, and to be significantly more below trend than it was when President Obama was inaugurated. Last week I explained how United States employment fell by a greater percentage than did its inflation-adjusted spending and output (gross domestic product, or G.D.P.). The pattern was not the same for other countries. The Organization for Economic Cooperation and Development has constructed indexes of employment and inflation-adjusted G.D.P. that are designed to be comparable across countries. 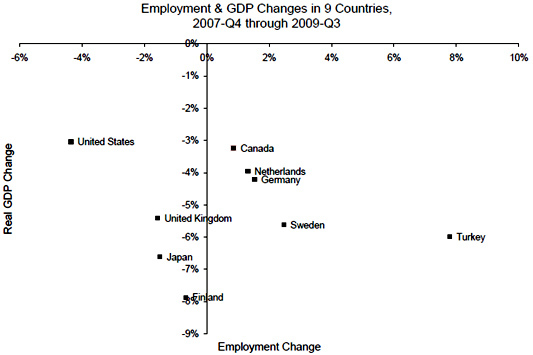 I have calculated percentage changes in each country’s employment index and in its real G.D.P. index from the fourth quarter of 2007 until the third quarter of 2009 (at least, for those countries for which these numbers are available). Each percentage change is displayed in the chart. Of the nine recession countries with data available, the United States is the only one with inflation-adjusted G.D.P. falling less than employment. Moreover, the United States has the biggest loss of jobs of the nine and the smallest real G.D.P. decline. The countries with greater G.D.P. drops tend to have smaller employment index declines (or even increases), and vice-versa. More research is needed to determine what the country comparisons tell us about the causes of the recessions and various government efforts to alleviate them. But it is interesting to consider whether, if we had the choice, we’d like the recession to be one with a large G.D.P. drop or a large employment drop. If it were up to me, I’d rather maintain my income without maintaining my employment, rather than maintaining my employment without maintaining my income. Thus, it could have been worse — as it was in at least eight other developed countries.